Eight people taken to hospital after being thrown from Memphis fair ride - 14 people thrown from ride - Over a dozen people were injured after they were thrown from an amusement ride in Tennessee. MEMPHIS, Tenn. -- Eight people were taken to hospitals after a ride shut down at the Delta Fair in Memphis, officials said Saturday. Riders were enjoying the Moonraker, which spins around an axis and tilts up and down on an angle, when the ride's computer detected a problem and immediately began safety shutdown, said Matt Snyder, the fair's safety director. As the ride stopped spinning and began to descend, the operator of the ride panicked and pressed a manual override button that released the safety restraints before it settled into its cradle. "It scared everybody," Snyder said. Initial reports that 14 people were thrown from the ride and taken to hospitals were "terribly inaccurate," said Earle Farrell, a spokesman from the Shelby County Sheriff's Office. Fair officials denied that anyone was thrown from or fell from the ride. Two adults and six children were transported to hospitals after walking from the ride under their own power. None had visible injuries, but some complained their ankles were hurting, Snyder said. Four more people were treated at the scene. One of the two adults who went to the hospital was the ride operator, who was emotionally shaken by the accident, officials said. The ride has been shut down but the fair remained open Saturday. The ride had received a technical inspection in the past three years, and two more inspections in the days before the fair opened this week, Snyder said. A ride inspector is scheduled to check the ride on Tuesday, said fair president Mark Lovell. 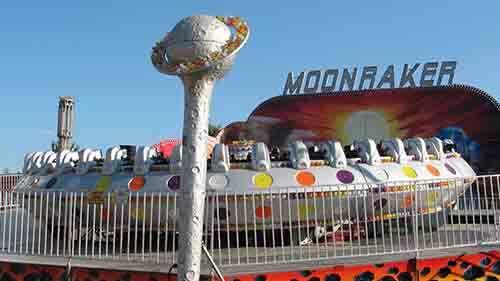 MEMPHIS - The Moonraker is still out of service at the Delta Fair after an accident sent seven riders, including five children, to the hospital. This has nothing to do with James Bond books, films, anything. In related news, J.W. Pepper's "Louisiana Bayou" speedboat ride grand opening has been delayed indefinitely. Absolutely. Just a malfunctioning centrifuge ride named Moonraker. Anybody know what the legalities are when using a trademarked Bond title in a commercial enterprise? Since 'moonraker' has more than one meaning, I doubt the word itself has been copyrighted. Rename your Sky Screamer ride 'Skyfall' and EON might have a case. I suppose they'd be in trouble if their design had suggestive silhouettes of a shooting figure or similar Bond-related stuff. But from the looks it's a pretty generic space-themed ride. The majority of the kids riding this will not even be aware of a Bond film of that name.